We moved to Saudi Arabia when I was about 4 or 5 years old, just about the time when you can start remembering things from your childhood. Growing up away from family, separated by an ocean on either side of us, could of have been isolating and lonely. Fortunately, my parents befriended a group of people who quickly became our surrogate family. Holidays, weekends, and birthdays were spent with this new group of aunts, uncles and cousins. We left Riyadh for Flint, Michigan in 1987. Slowly after, other members of the group left Saudi and moved to different cities around America and Canada. Soon, we were able to visit our “friends from Saudi Arabia” in new places like Ottawa, Baton Rouge, and Colorado Springs. We spent a lot of time in the car in the early 90’s. My parents and their friends (and us kids to some extent) kept friendships going for over 25 years after separating from each other. People moved home and life moved on with children, marriages, graduations, and moving overseas. And yet, this group never lost contact with each other. Sure, we’re all Facebook friends now but there was a time when we relied only on phone calls and mail to get us through the times in between visits. Friendships that last this long are no longer friendships. They’re family. And today, we mourn the loss of a family member. Tante Rawia, we will miss you dearly. I will miss the sound of your voice. I will miss seeing you play cards with my parents. I will miss seeing you. I am fortunate to have had you in my life for so long. 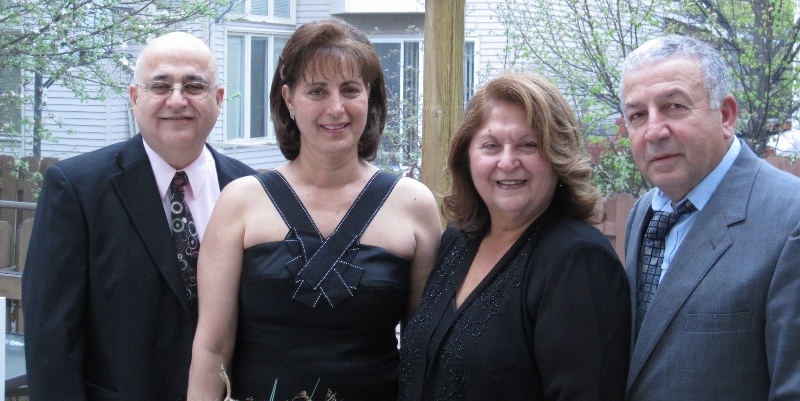 (L to R) Amo Massoud, Tante Rawia and my parents.